I’ve started a new chapter in my life. Excellence V is no longer my employer, great times and cooking I will remember. Family life has caught up with me and from now on I will offer my services on a freelance and temporary base. Please check out the updated site and info. As promised a few times, I finally share this Thomas Keller Macaroon recipe with you. I’ve tried several recipes and this is the most reliable that works with various colors and flavors. I promise you it will work out 7 out of 10 times. 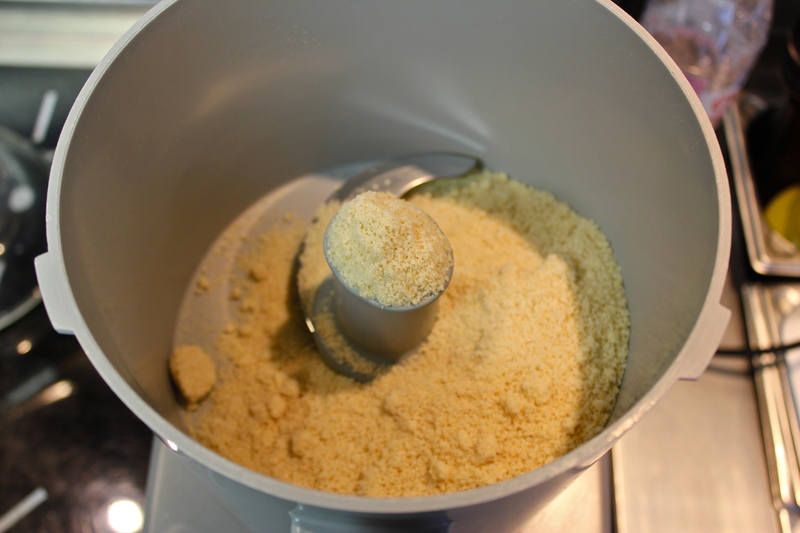 The quality of the almond flour and egg white is very important and the result can vary immensely with identical measurements. 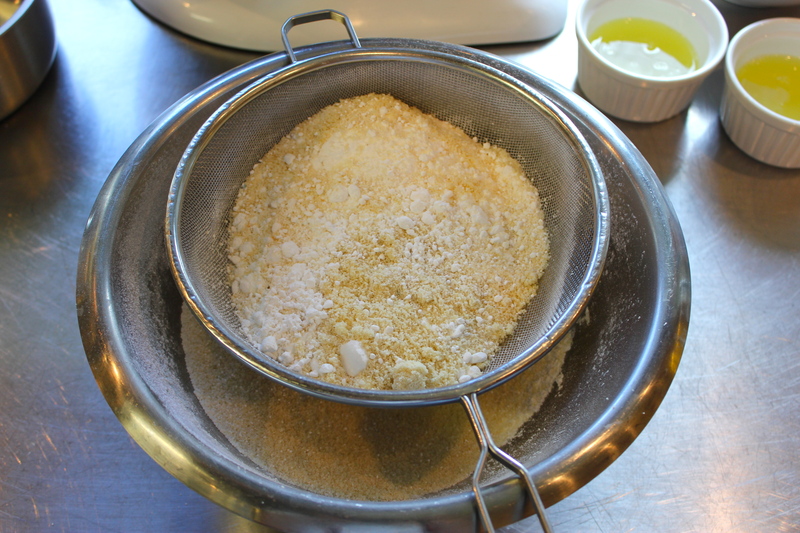 Combine the 236 grams sugar and water in a small saucepan and heat over medium heat until it reaches 120C. 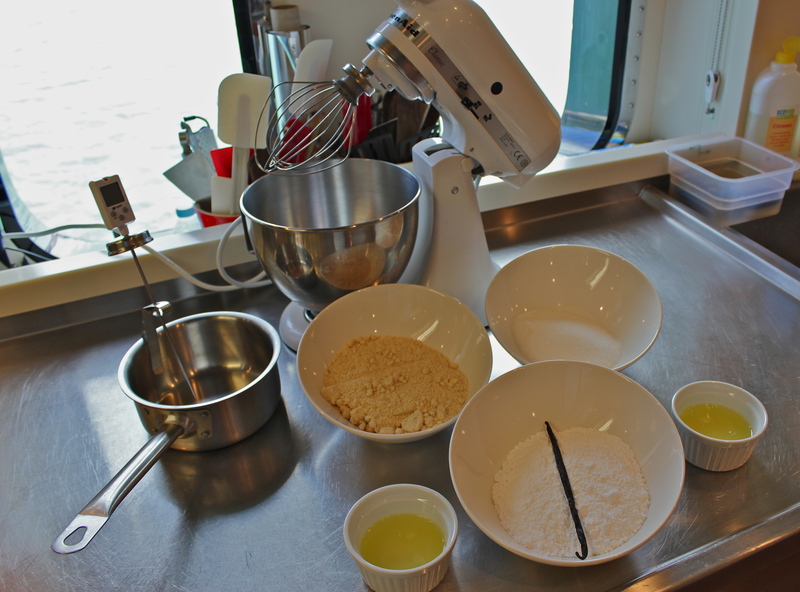 Make sure you pour the syrup on the side of the bowl and it doesn’t touch the whisk. The trip to the south of France went really good. We had seas calm enough to start our prep for the upcoming guest trip. All the pastries are done. Ice creams, sorbets, 5 kinds of stock etc are ready in the freezer. In the future I will show you how we get all this little helpers ready by video. Tomorrow we have our first photo shoot for a yachting magazine. There will be arial shots, interior and exterior close ups. I’ve prepared some snacks that will look good on the tables. I hope I can share the pictures with you soon. In the meantime enjoy a short video from our departure in Bremen. We’ve been on the way from Bremen via Gibraltar, arriving in Nice tomorrow evening. The first couple of days, the ocean has been quite gentle with us. Then the wind and currents have picked up and we had to place nonskid on our counters… Not the perfect environment to play with plated dishes. On our stop in Gibraltar I also bought my first DSLR camera. Since we have left the “Rock”, the Mediterranean Sea is as we love it: Like glass! We even saw dolphins jumping trough the galley windows. Hopefully one day I will be lucky enough to catch one on camera. So, new camera, perfect sailing condition and my Alinea cookbook asked me to make a little dessert. I chose this Grand Achatz inspired dish because I wanted to play with Tapioca Maltodextrin, which allows to create powders from various liquids. In this recipe it is used for olive oil vanilla powder. Second, I always wanted to try olive oil ice cream.